Smartphones are are part of our daily life and everyone wants to own a smartphone, especially when it comes at budget price. 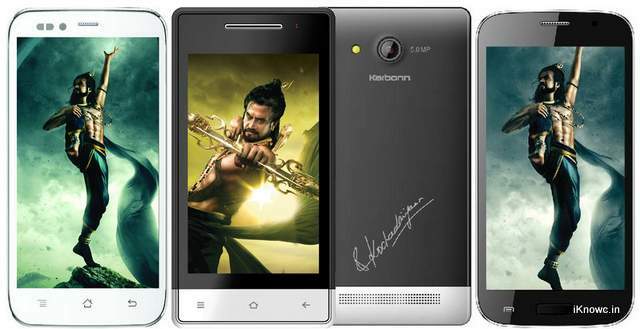 Karbonn Mobiles has announced there budget smartphones in there new Kochadaiiyaan Signature Series targeting at Rajnikanth’s upcoming movie. The handset are available from online retailers and outlet stores. The Karbonn A36 is a dual SIM phone and lacks the 3G support, which would be the major disappointment. It has 5 inch 560 x540 pixels qHD display, dual core processor paired with 512MB of RAM and Android v4.0 Ice Cream Sandwich OS. There is 1800 mAh battery and it offfers 2G, Edge, WiFi, Bluetooth and Fm Radio support. The Karbonn A36 is priced at RS 6,199 and is available from flipkart. It has 4GB of internal storage and 2MP rear and a VGA front camera. Karbonn A6+ features a 4 inch 480 x 800 pixels WVGA IPS display and 1.0GHz CPU integrated with 512MB of RAM. It has 2-megapixel primary shooter with flash and a secondary VGA shooter. It has 4 gigs of internal memory and it also lacks the 3G network support. It houses 1400 mAh battery and offers basic connectivity options. The price of the Karbonn A6 plus in not know yet. The Karbonn Titanium S5i was announced last month and it comes with a 5inch FWVGA resolution display. The handset is powered by 1 GHz dual core CPU paired with 512MB of RAM. It packs with a 5MP rear and a 0.3MP front camera. It has 4 GB of ROM and 32 GB expandable memory. It offers 3G, WiFi, Bluetooth, GPS and micro USB connectivity options. There is 2000 mAh battery to make the handset alive. Karbonn has also launched Legend 2.4 and 2.8 feature phones.